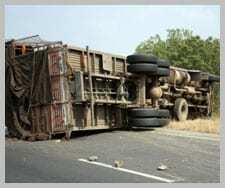 Truck Accident Cases | BEATTIE LAW FIRM, P.C. When trucks are speeding through Iowa on I-80, I-35, I-235, I-380, I-29 or on any other road in Iowa, a miscalculation, misjudgment or inattention can cause a semi crash that seriously injures those in the cars they crash into and sometimes results in tragic death. At the Beattie Law Firm in Des Moines, our Iowa truck accident lawyers represent people who have been injured or killed in truck accidents. In a trucking accident, there are many factors that require careful investigation. The accident may be the result of a driver who has a prior history of accidents, a driver who has been on the road too long, a driver simply driving too fast. No matter what the cause, though, make sure you have a personal injury attorney who understands the mechanics of a truck accident as well as the law and your rights. The injuries suffered in a truck accident are severe and often include death. At our law firm, we have the experience and the determination it takes to obtain maximum compensation for our clients. More importantly, we can provide peace of mind that your claim is being handled efficiently and effectively by an experienced Iowa accident attorney. In order to meet deadlines, truckers will often speed or drive when tired. Trucks may be overloaded or loaded improperly so that the cargo shifts and causes an imbalance. Our lawyers and investigators look into driver histories and driver training and licensing. We examine maintenance logs. Was the driver distracted by a cell phone call, texting or entering data into an on-board computer? We will answer these questions for you. The more we know about the truck accident, the better we can represent our clients. For more information, please visit our settlements and verdicts page. To schedule an appointment with an experienced lawyer regarding a truck accident injury, please contact us.